God is Bigger! Don't Be Impressed With Lesser Things. Amos 4:13 He who forms the mountains, who creates the wind, and who reveals his thoughts to mankind, who turns dawn to darkness, and treads on the heights of the earth-- the LORD God Almighty is his name. The bigger you see God, the more He can do for you and the more you can do for Him! When God reveals some of His thoughts, you can believe those are some BIG THOUGHTS! When you have seen the greatness of God you will not be as impressed by lesser things. Too often, people are cheated and deceived by becoming impressed with lesser things. Seeing a big God helps you put all other things into proper perspective. The devil tried to impress Jesus to gain His attention and loyalty. It didn’t work! Luke 4:5 Then the devil, taking Him up on a high mountain, showed Him all the kingdoms of the world in a moment of time. 6 And the devil said to Him, “All this authority I will give You, and their glory; for this has been delivered to me, and I give it to whomever I wish. 7 Therefore, if You will worship before me, all will be Yours.” 8 And Jesus answered and said to him, “Get behind Me, Satan!For t is written, ‘You shall worship the Lord your God, and Him only you shall serve. The offer of receiving the kingdoms of the world would be attractive to a lot of people. However, Jesus was not impressed! He is “The word made flesh,” King of kings, Lord of lords, has all authority in heaven and earth, creator of the ends of the earth, and much more! Keep that in mind the next time when people you don't know try to make themselves impressive to gain your favor, loyalty, or money, or when you are offered some product or “deal” said to be “most impressive." Honor, follow and support people who genuinely serve and bless you. Your heart has already be captured by the most impressive Person, opportunity, and lifestyle possible! 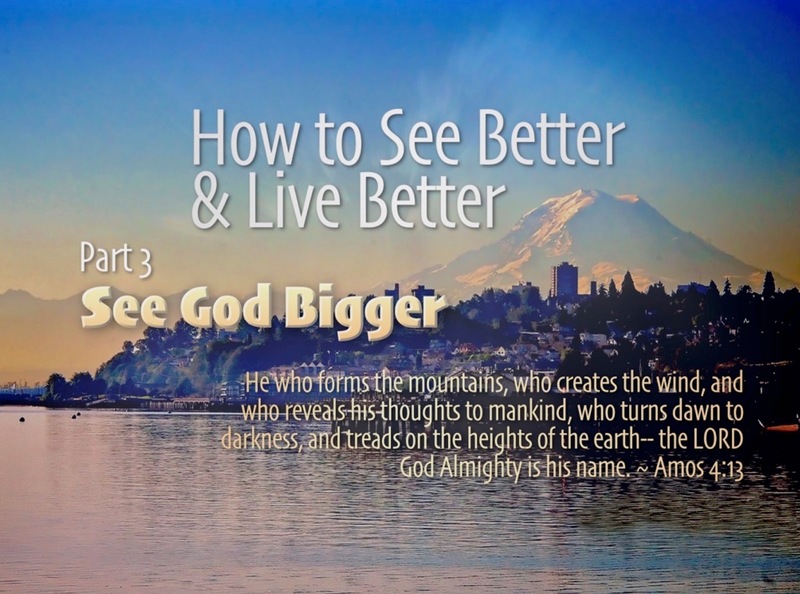 Listen to the message: "See God Bigger"